Good morning. I'd like to welcome you to the 2017 Community Bankers Conference. The Federal Reserve Bank of New York is pleased to once again host this conference and to continue to foster a robust dialogue on key industry trends and supervisory issues affecting community banks. In addition to about 130 representatives of community and smaller regional banks in the Second District of the Federal Reserve System, we are happy to welcome fellow supervisors from the states of New York, Connecticut and New Jersey; representatives of the FDIC and the OCC; and colleagues from the Board of Governors and Philadelphia, Cleveland, Chicago and Atlanta Federal Reserve Banks. In all, we have record attendance with 178 participants. As in past years, our goal for this conference is to promote a constructive dialogue between senior managers and directors of smaller financial organizations in our District and federal and state supervisors. This type of constructive engagement helps us reach our shared objective of resilient financial institutions operating in a safe and sound financial system that supports the growth and stability of the U.S. economy. During my brief remarks this morning, I'd like to highlight three related topics that I believe are relevant to you as community bankers: the critical role that community banks play in the U.S. economy, particularly at the local level; trends in small business lending; and recent efforts to enhance the efficiency of the regulatory and supervisory framework. My comments today are my own and do not necessarily represent those of the Federal Reserve Bank of New York or the Federal Reserve System. Let me begin with some thoughts on what we seek to achieve through supervision. A core objective for safety and soundness supervision is to ensure that supervised entities are resilient. That is, a firm should be able to continue to operate and provide financial services across a wide range of economic and financial conditions. Supervisors and regulators can support this objective through our focus on stronger capital and liquidity, comprehensive risk management and robust governance and controls. All of this makes firms resilient to unexpected shocks and allows them to continue to serve their customers and communities. Resilience, however, is not the end objective. Rather, we seek to ensure that banks of all sizes contribute to the sustained and efficient provision of credit and other financial services to consumers and businesses that support the growth and stability of the economy. Community banks play a distinctive role in the provision of financial services, offering a wide range of products and serving specific segments. Community banks often use a unique "relationship-based" approach that, for example, leverages personal knowledge of their customers' creditworthiness and local business conditions to customize lending decisions and meet demand for credit and other financial services. This allows both consumers and small businesses to contribute to economic activity. Community banks also provide important financial services to key – often underserved – sectors of the economy. For example, a study from a few years ago found that almost one out of five U.S. counties has no other physical banking offices except those operated by community banks.1 As a second example, in the typical county in the Second District (excluding Puerto Rico and the Virgin Islands), community banks account for about half of all banking deposits. It is the ability of smaller institutions to leverage "soft information" in important ways and reach underserved sectors that gives community banks a unique and critical role in driving sustainable economic growth. Supervisors are also keenly aware of the potential unintended consequences of the supervisory and regulatory framework. One of our goals as supervisors is to ensure that our efforts are not having an adverse effect on the ability of firms to provide credit and financial services that supports economic growth at businesses of all sizes. As I said in an earlier talk, in my view, it is entirely appropriate to continuously evaluate and rigorously debate whether the supervisory and regulatory framework is meeting its objectives efficiently.2 I'll return to this topic shortly. As we evaluate the financial system and the broader economy, we regularly examine firms from a horizontal and aggregate perspective to gain insight on the trends in the provision of financial services in the Second District. Today, I'll say a few words on trends in small business lending. Of course, looking at trends is not sufficient to identify causal relationships, but it does provide one perspective on these developments and identifies areas for future inquiry. 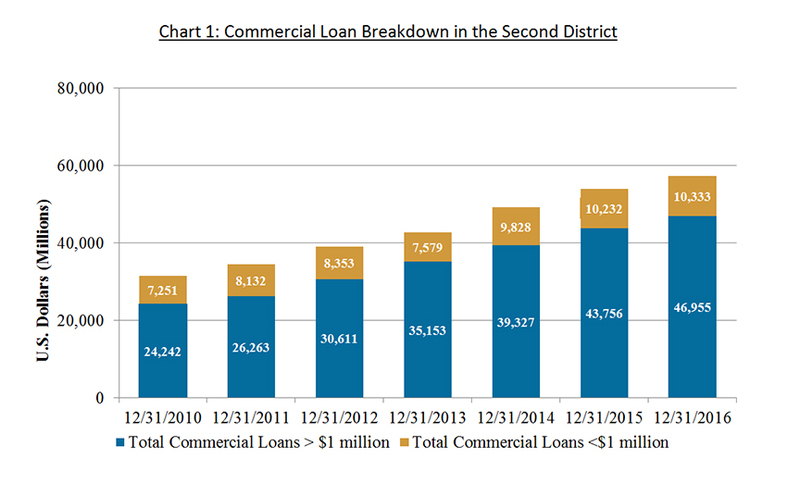 The overall level of commercial and industrial (C&I) lending at Second District firms with under $50 billion in total assets has grown steadily in recent years (Chart 1). Since the financial crisis, these loans have increased by just over 80 percent, which is somewhat faster than growth at the national level of 64 percent over the same period. Within commercial and industrial (C&I) lending for these banks, small business lending is particularly important, given the traditional role of small businesses in job creation. While data are not immediately available on borrower size, we can look at a simple proxy for small business lending by isolating individual C&I loans to commercial borrowers that are each under $1 million. These data show that while the dollar value of small C&I loans has grown since 2010, the pace of growth has not been as high as overall C&I lending growth. 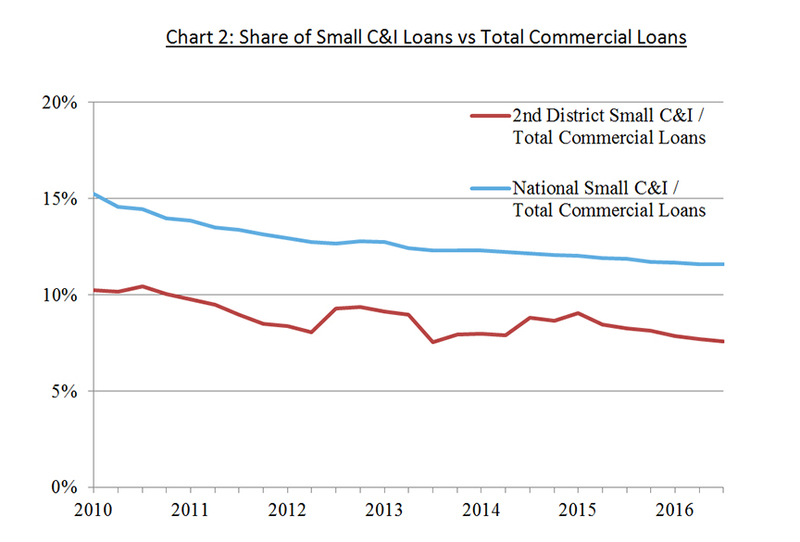 As a result, small C&I loans now constitute a smaller portion of total C&I lending, both in the Second District and nationally (Chart 2). This is likely due, in part, to nominal factors, but could also reflect underlying economic conditions. Turning to community banks, they have historically held a disproportionate amount of small commercial loans, and this is a trend that has continued post-crisis. 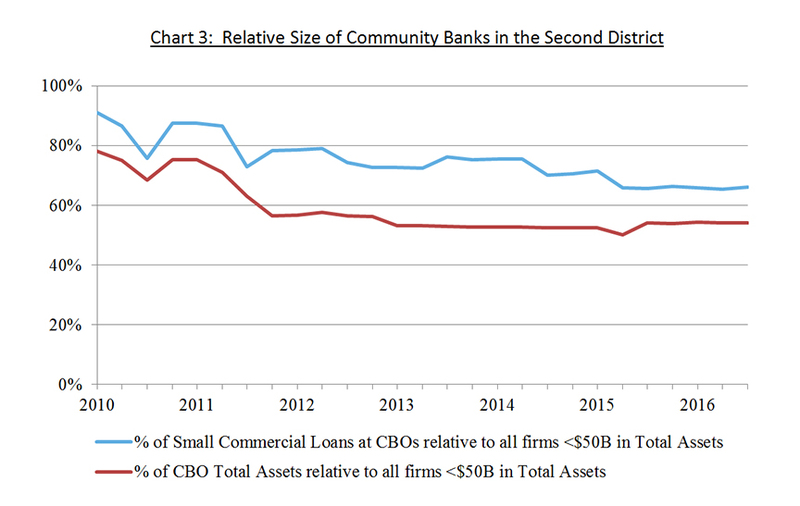 Among all Second District firms with less than $50 billion in total assets, community banking organizations (CBOs) hold 54 percent of total assets, but 66 percent of total small commercial loans. This share has declined somewhat since 2011 (Chart 3). Within small commercial lending, CBOs are especially important when it comes to small commercial real estate (CRE) loans, providing 79 percent of total CRE loans under $1 million. Given the importance of small businesses to employment and growth in so many communities around our District, we welcome hearing your views on what might be driving these trends. More generally, we are interested in your assessment of business and lending conditions in the communities that you serve. What are the key challenges and opportunities that community banks face? Your insight will provide a key supplement to our quantitative research, and combining these two perspectives will support our efforts to understand what we are seeing in small business lending. Our supervisory teams are interested in your insights when we visit your organizations to conduct examinations and in venues like this conference. As I’ve said earlier, supervisors recognize it is important to ensure that the oversight framework continues to function efficiently. In that regard, the Federal Reserve recently participated in a review, as mandated by the Economic Growth and Regulatory Paperwork Reduction Act of 1996 (EGRPRA), to identify rules that are outdated, unnecessary, or unduly burdensome. The full report covers 430 pages, so I'd like to highlight three of the recommendations that may be of interest to Second District community bankers. They relate to simplifying capital requirements; reducing regulatory reporting; and reducing the frequency of examinations for certain qualifying, smaller firms. Capital is in many ways the foundation of the health of the banking system. It's important to note that more than 500 banks failed during and after the financial crisis because they lacked sufficient capital, and many of them were community banks. Nonetheless, we have consistently heard since then that some of the capital rules are too complex for community banks and not commensurate with their size and risk profile. This link with the risk profile is critical and an important part of our efforts to "tailor" our supervisory approaches. As part of the EGRPRA process, we are continuing to think about ways to simplify the capital rules. The agencies are developing a proposal and are planning to seek industry comments on certain proposed amendments to the capital rules. Such amendments could include (1) replacing the framework's complex treatment of high volatility commercial real estate exposures, (2) simplifying the current regulatory capital treatment for mortgage servicing assets and regulatory capital instruments issued by financial institutions; and (3) simplifying the current limitations on minority interests in regulatory capital. I should note that, in April 2015, the Board approved a final rule that raised the asset threshold of the Small Bank Holding Company (BHC) Policy Statement from less than $500 million in total consolidated assets to less than $1 billion in total consolidated assets and expanded the application of the policy statement to savings and loan holding companies (SLHCs). After the issuance of the final rule, 89 percent of all BHCs and 81 percent of all savings and loan holding companies were covered by the policy statement and were excluded from certain consolidated capital requirements. A second relevant topic reflects the challenges and burdens for smaller firms to file Call Reports. In response to industry concerns, the agencies began in 2014 the process to streamline the Call Report for community banks and subsequently published a series of proposals for comment. The result is that, effective March 31, 2017, Call Report requirements have been streamlined for community banks. This new Call Report will reduce the number of report pages from 85 to 61 pages and will remove approximately 40 percent of the data items currently included in the capital schedule. A third example concerns the frequency of examinations. Some firms proposed lengthening the period of time between examinations, including increasing the asset size limit for community banks to qualify for the 18-month cycle. In response, the agencies supported a change to statutes that govern examination frequency. Subsequent legislation enacted in 2015 permitted qualifying firms under $1 billion in total asset size to be subject to an 18-month examination cycle for safety and soundness examinations. The final rule for this legislation was issued at the end of last year and is now in force. In addition to our review of regulations, supervisors periodically review existing supervisory guidance to evaluate relevance and effectiveness. The Board completed a policy review of the supervision programs for community and regional banking organizations to make sure that these programs and related supervisory guidance appropriately align with current banking practices and risks. As a result of this review, the Board eliminated 78 guidance letters that are no longer relevant. As I mentioned, one of the core objectives of supervision and regulation is to support resilience in supervised firms so that they can contribute to the sustained provision of credit and other financial services. We strive to do that in the most effective and efficient manner possible. I mentioned just a few examples of our work in this area, and I look forward to continued dialogue on this key topic. We at the Federal Reserve Bank of New York and the Federal Reserve System have a strong interest in understanding the issues facing community banks and ensuring that they continue to play their critical role in the U.S. financial system. We hope that today's conference sparks an informative discussion around many of those issues. I'll conclude by noting that this conference is just one of several initiatives to encourage communication and outreach with the industry. The Federal Reserve Board also has initiated numerous industry outreach opportunities to provide resources on key supervisory policies, including the development of two programs—"Outlook Live" and "Ask the Fed"—as well as the publication of three newsletters—Community Banking Connections, Consumer Compliance Outlook, and FedLinks. We hope you are able to utilize these resources, and our team will be happy to provide instructions on how you can subscribe to them. Thank you for joining our conference today; I hope you will find today's presentations useful and informative. 1 FDIC Community Banking Study (December 2012). 2 A Perspective on Supervisory Objectives and Trade-offs, February 23, 2017. 3 The Banking Crisis of the 1980s and Early 1990s: Summary and Implications, FDIC.